I know you’ve heard the expression, “it’s like herding cats.” That feeling of exasperation must be a common thought for retirement professionals when faced with the myriad of articles, reports, and projections surrounding the Department of Labor Fiduciary Rule. First, the DOL ruling was slated to begin April 10, only to be postponed to June 9. In early June, the DOL rolled out the ruling, but some report that it had “no bite,” because enforcement of the ruling would be delayed to next year. Today, there are statements the transition period could be anywhere from January 1 to July 1, 2018. If you’re as confused by all of this, you’re not alone. A recent article in Plan Consultant from Summer 2017 devotes the cover story to the Fiduciary Ruling and it’s stormy start. Uncharted Waters: The New DOL Under President Trump follows the course of the Fiduciary Rule from post-election of Donald Trump as President, through the path it took as it was cruising into the April implementation date, to today. 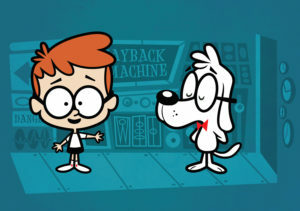 Thanks to Mr. Peabody and Sherman, we can use the Wayback Machine! made famous in Peabody’s Improbable History by Ted Key. To further complicate matters, this ruling was earlier thrown off course. To understand the ups and downs of the DOL Fiduciary Rule, you need to get in the Way Back Machine and visit former President Barack Obama. The DOL Fiduciary Rule started taking shape in 2010, during the Obama administration, as a way to protect retirement savers from conflicted advice. The proposed regulation was withdrawn in 2010 because of pushback from the industry. As noted in a timeline article written by Ashlea Ebeling for Forbes and reported March 23, 2017, the current delay is certainly not the first. The upside to all of this, if there is one, is that the retirement industry has carefully evaluated their policies with regard to conflict of interest, financial advice, compensation, compliance, and other areas impacted by the proposed ruling. The adjustments made by the retirement industry to the planned regulations occurred in such a way that even if the rule were rescinded, much of the intent to protect plan participants and plan sponsors would remain. It could be argued that all of this maneuvering of tactics to delay, revise, adapt, delay, and reaffirm is a moot point as there is already a request on the table to push the implementation out another 18 months to 2019; while the retirement industry has been formulating stronger policies to work toward the best interest of the client, increase protections toward fiduciary liability, and evaluate then implement options to remove possible points of litigation. To read more of Mr. Clark’s article, Uncharted Waters, from Plan Consultant, Summer 2017, click here. To refresh yourself on the timeline of events surrounding the DOL Fiduciary Rule, click here for a Forbes article. Or, you can click here to read the timeline of events since 1934 from Investment News. Hold your horses! Last minute news of a possible delay to 2019 via Investment News and the Office of Management & Budget.